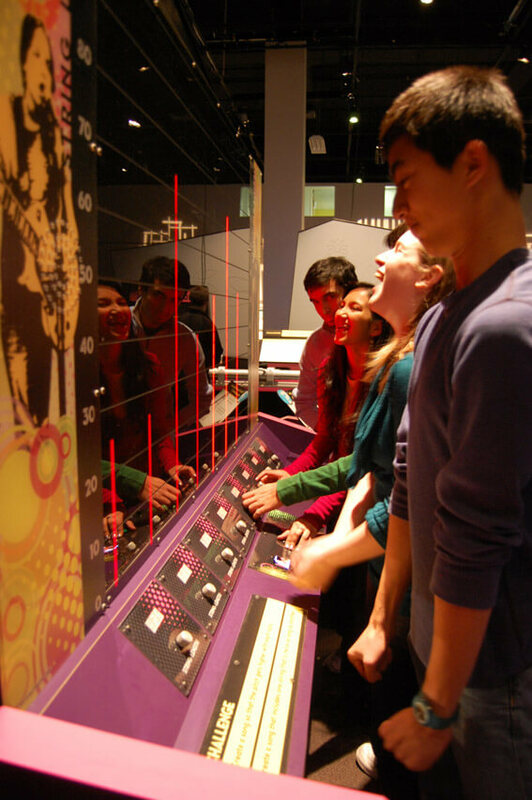 Design Zone highlights the relationship between mathematical thinking and the creative process in art, music, and engineering with three interactive thematic areas. 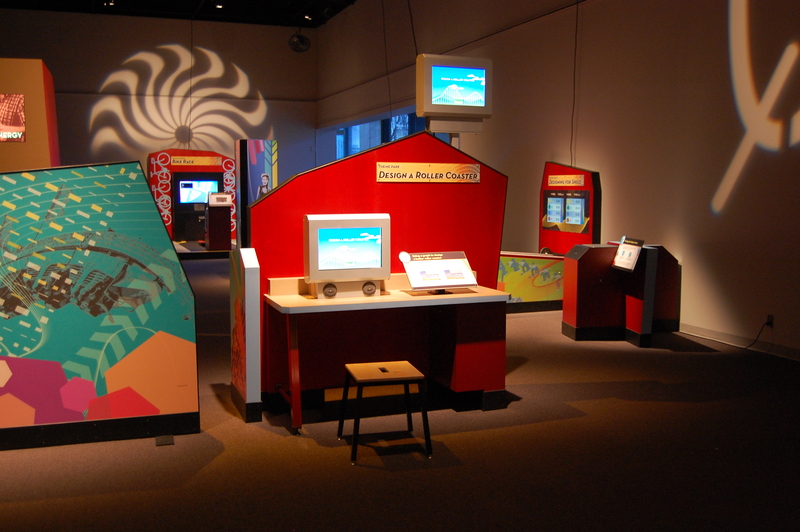 Design Zone has a wide visitor appeal, and was developed for families, school groups, and ages 10 - 14. 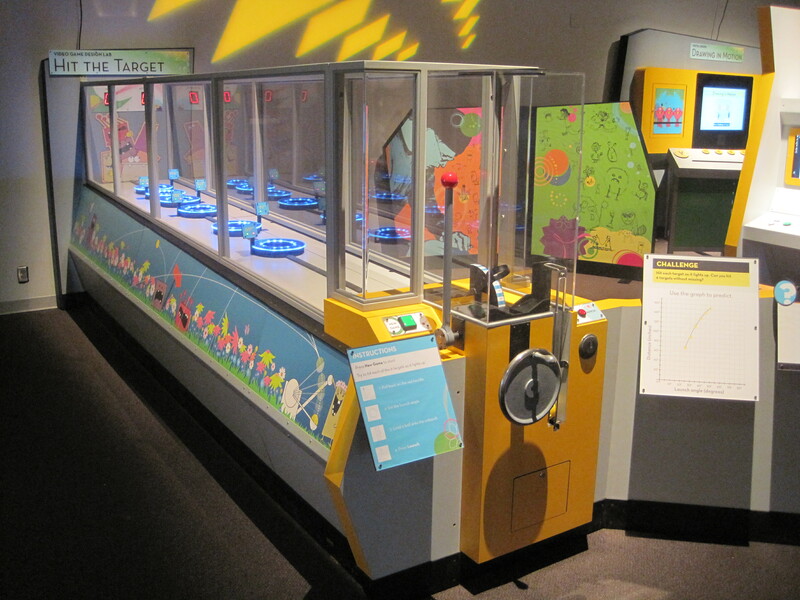 Hit the Target - In this full-body experience, you can launch a ball in the air and attempt to hit a target while learning more about the relationship between release angle and distance traveled. 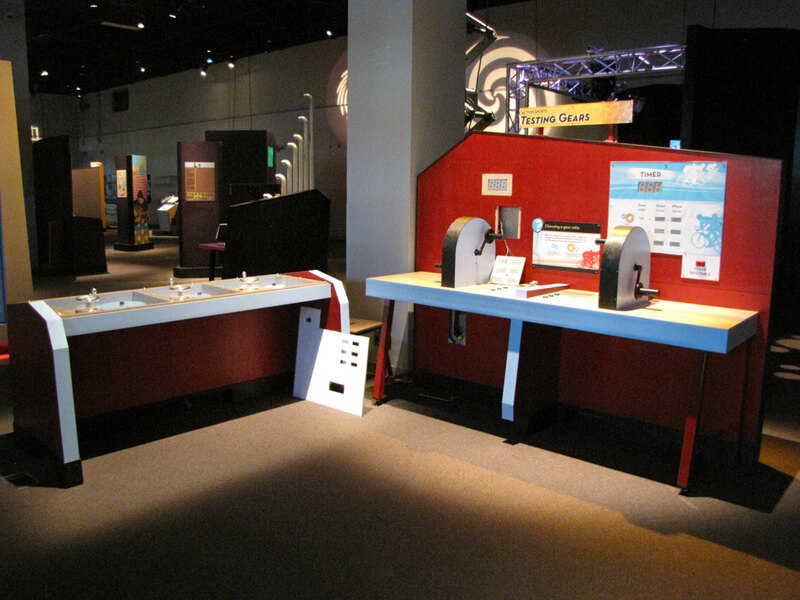 Design A Roller Coaster—Take on the role of a roller coaster designer and test one of your company’s latest designs. 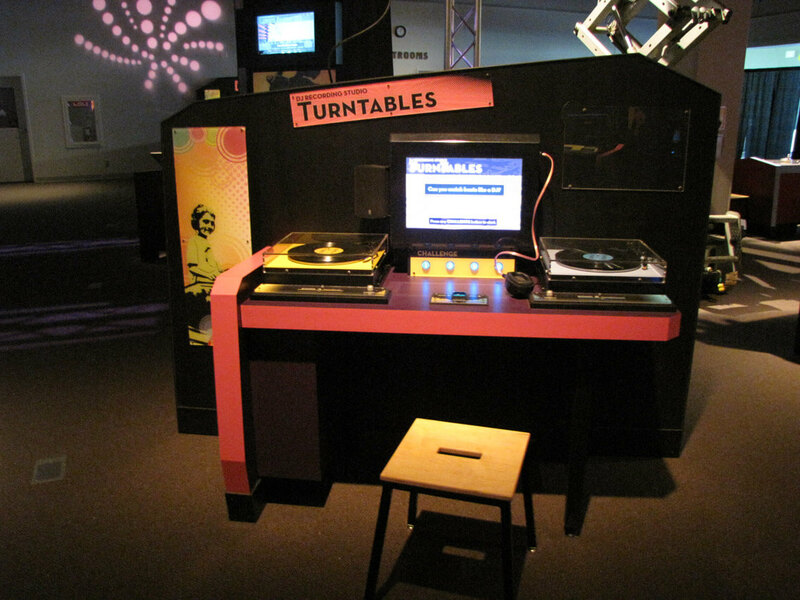 Turntables—Visitors use a graph of beats per minute to help them adjust the tempos of two songs up or down until they match to make a transition as smoothly as a professional DJ. 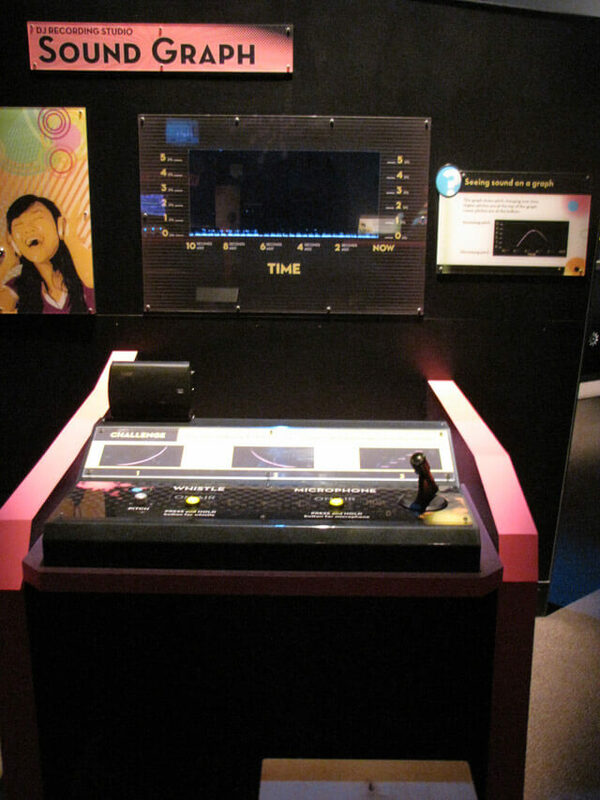 Sound Graph—Visitors talk, sing, or whistle into a microphone and see the sound displayed on a colorful, real-time graph of pitch over time. 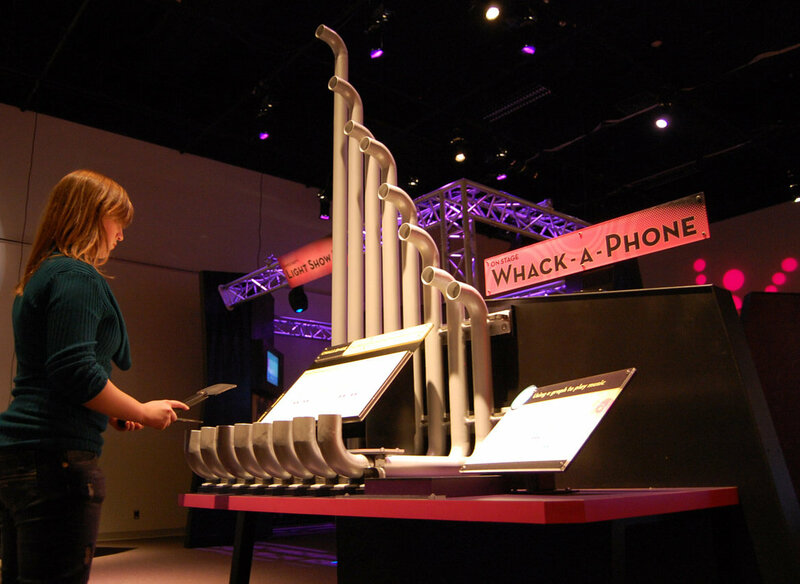 Whack-a-Phone—By whacking tubes of different lengths, your visitors make music! 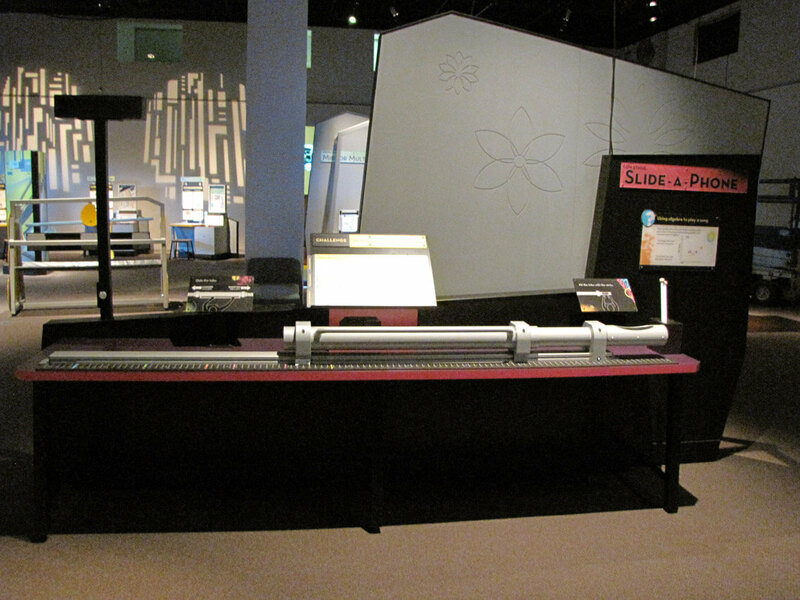 The length of the tube determines the pitch. 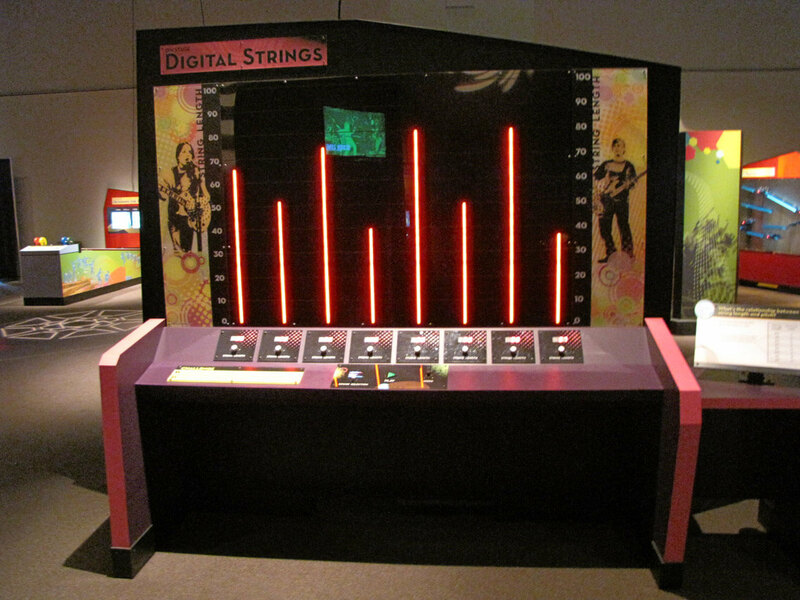 Digital Strings—This electronic instrument uses the relationship between string length and pitch to create music. 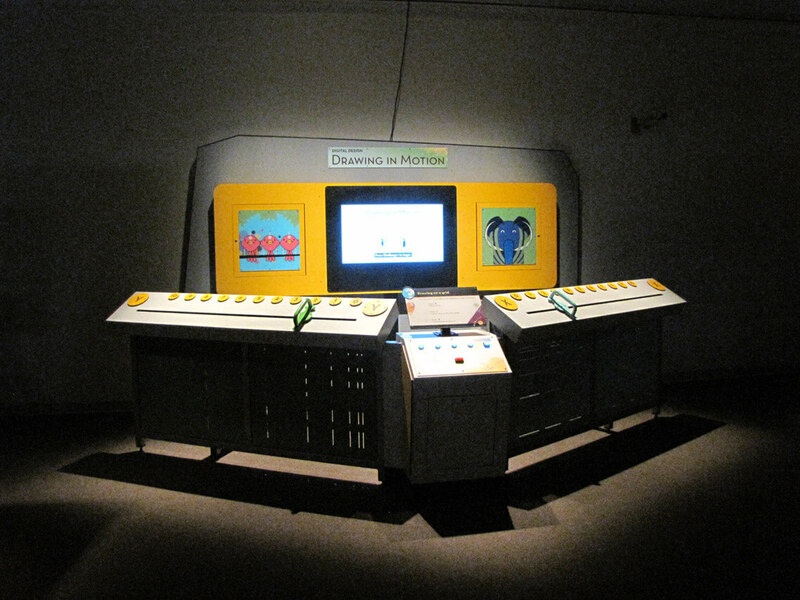 Visitors adjust the lengths of eight virtual strings, and then push a button to hear their musical pattern. 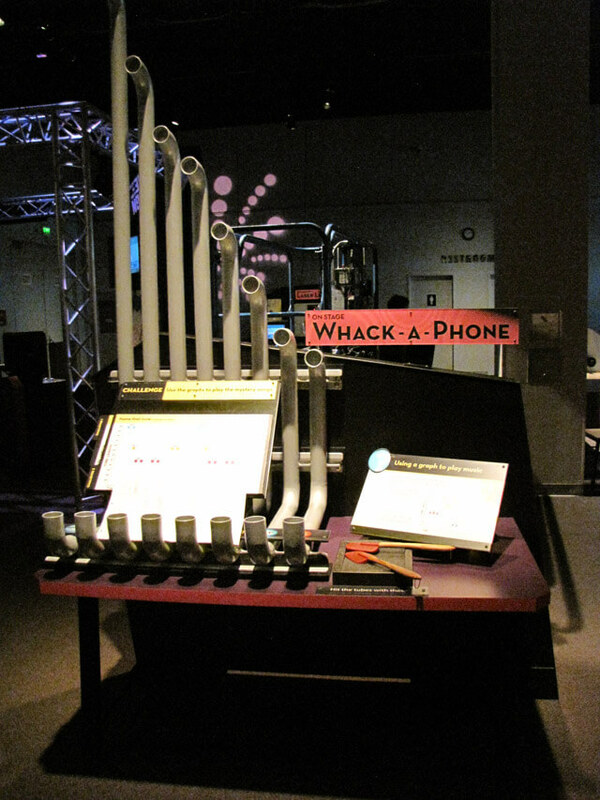 Slide-a-Phone—Adjust the overall length of the tube to change the pitch of the sound. 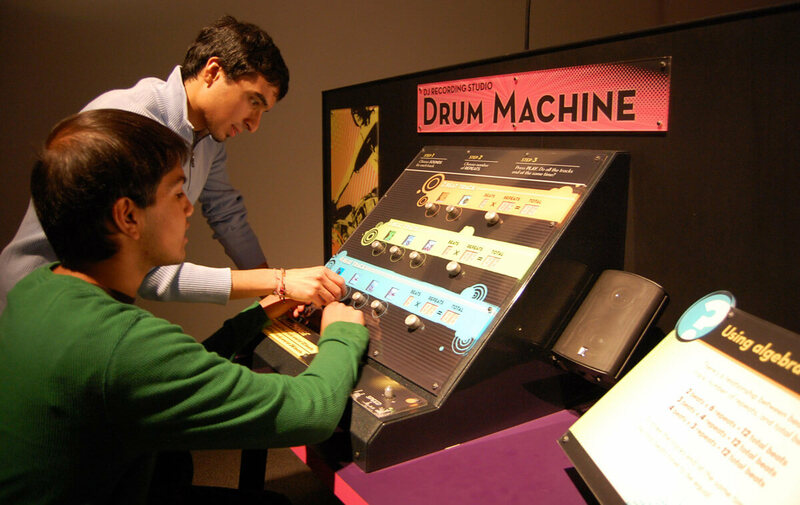 While one person beats on the drumhead, the other slides the tube to play different notes. 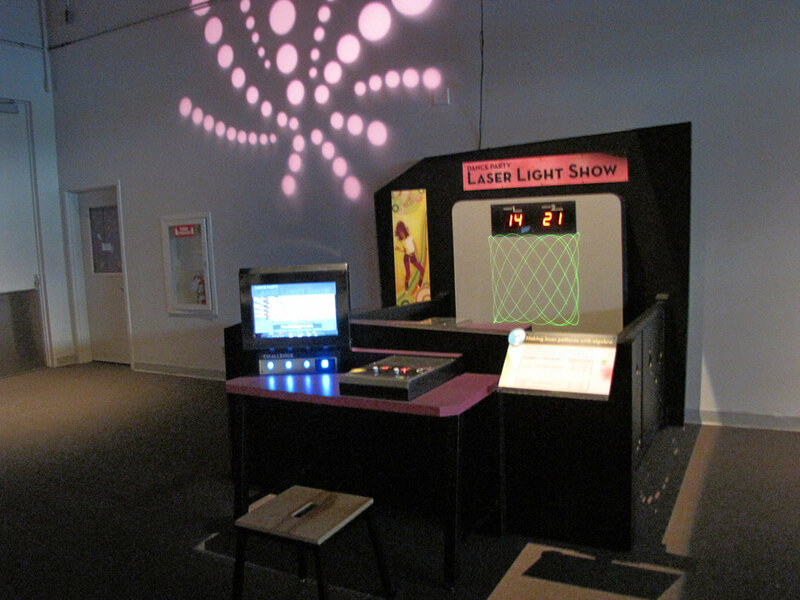 Laser Light Show—Using a real laser, you can change the ratio of how fast one mirror moves relative to the other to create Lissajous patterns, the basis for many laser light show effects. 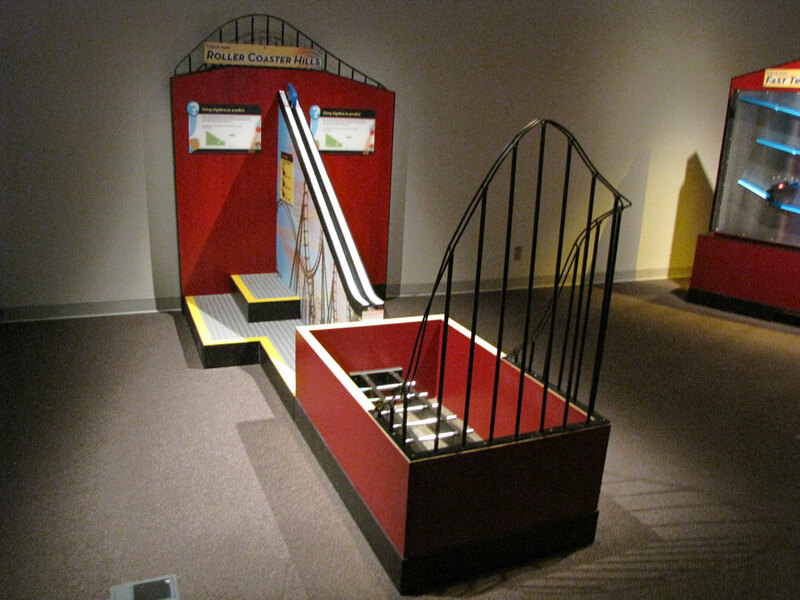 Roller Coaster Hills—The first step in roller coaster design is to understand the relationship between hill height and distance traveled. 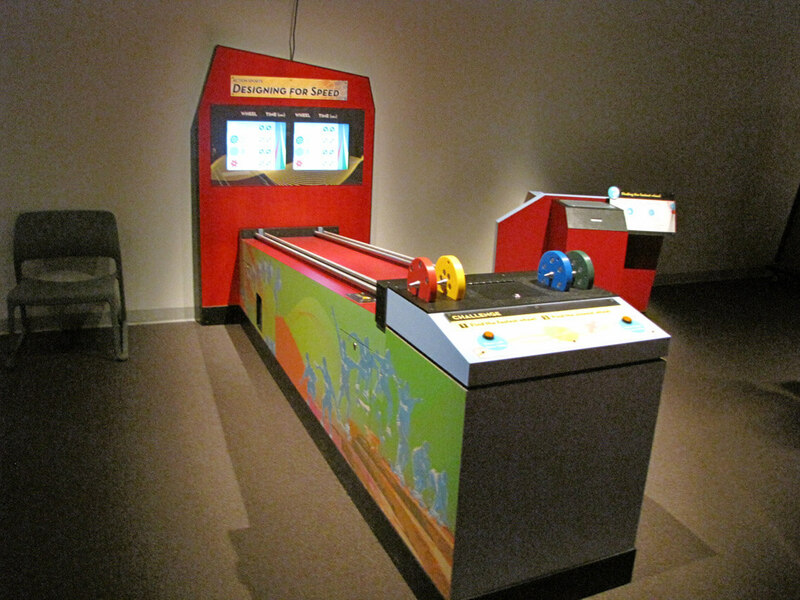 Start a ball rolling down a ramp from different heights to see how far it travels. 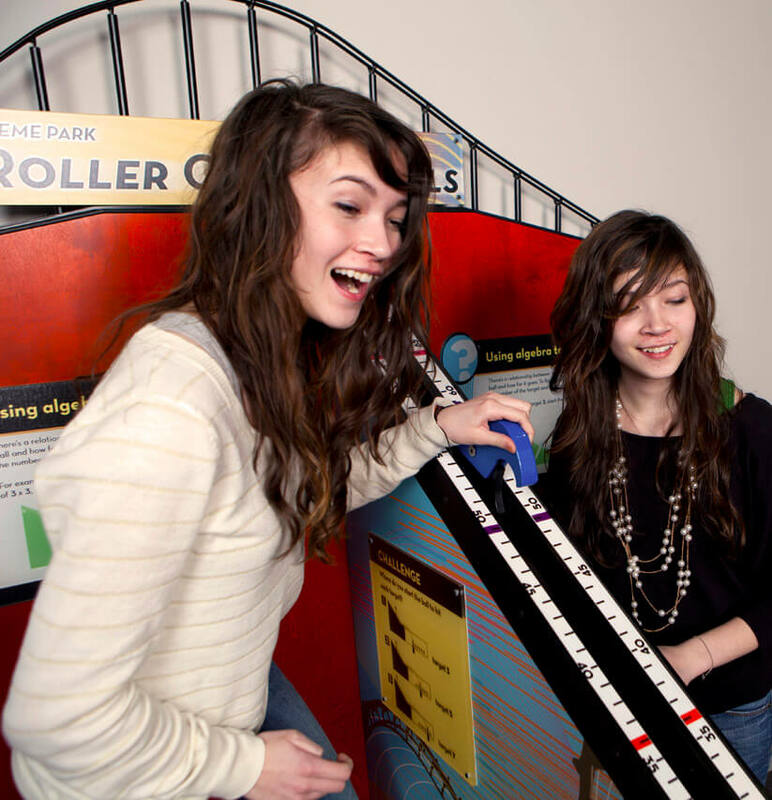 Design a Roller Coaster—In this computer graphing simulation, visitors design and test virtual roller coaster tracks and discover how hill height affects speed. 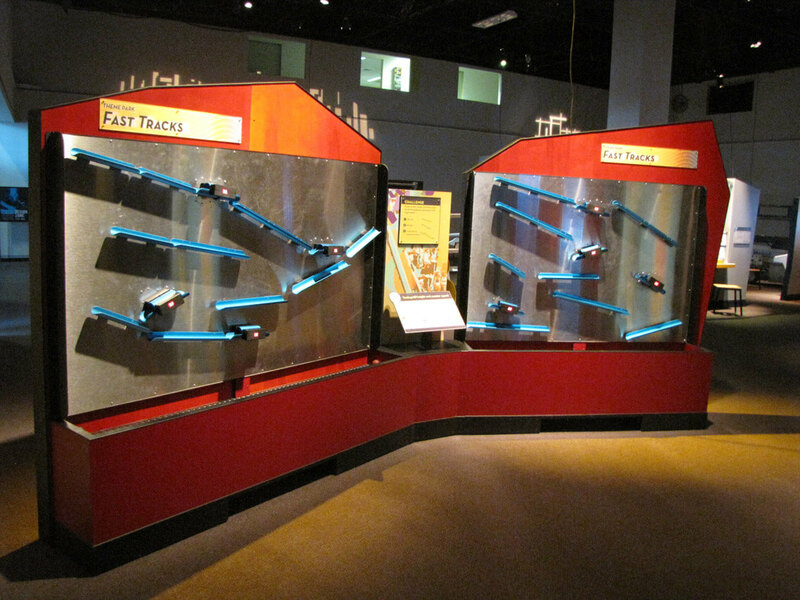 Fast Tracks—This giant magnet wall lets visitors create and test their own roller coaster course. 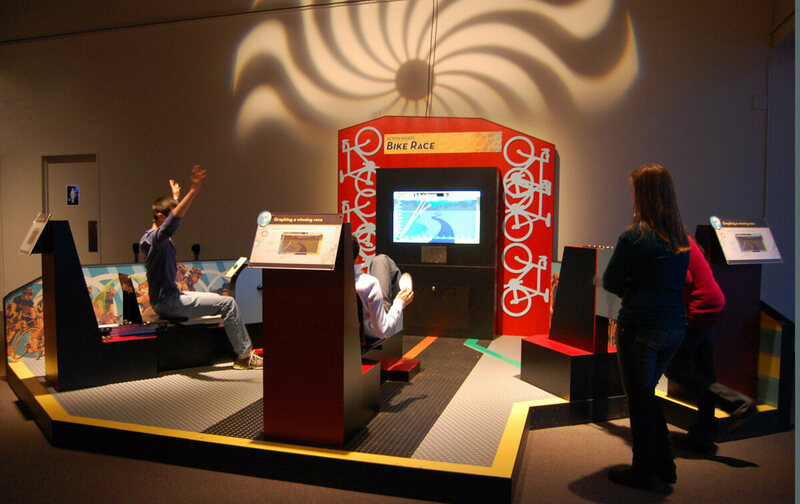 Bike Race—Choose from 3 bike stations, including two recumbent bicycles and a hand crank to experience a full-body bike race. 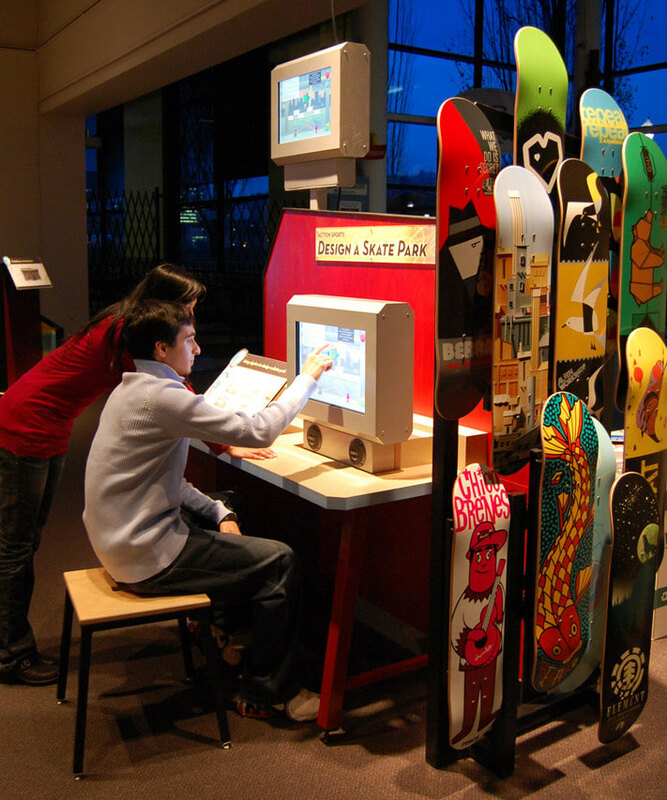 Design a Skate Park—In this computer game, visitors manipulate the slope and length of ramps to create essential skate park features. 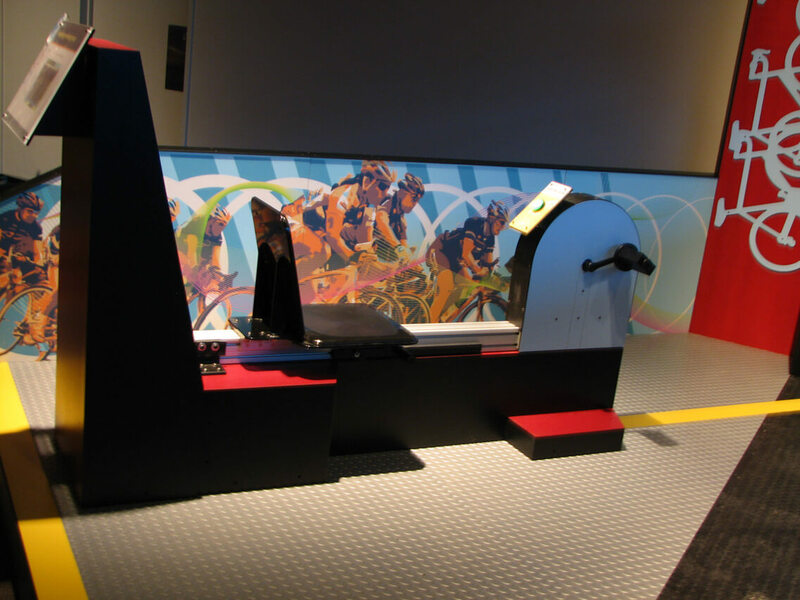 Testing Gears—Feel the difference between the forces needed to perform work with three different gear combinations on two hand cranks. 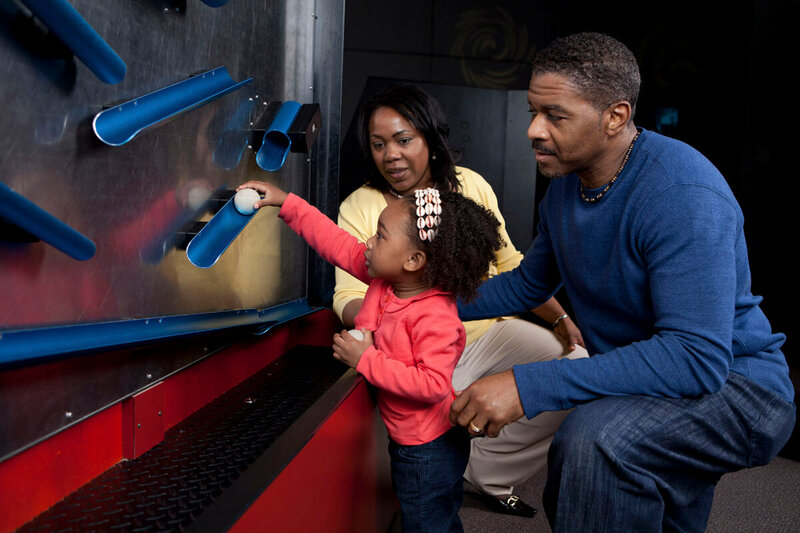 Designing for Speed—Visitors discover the effect of weight distribution on the speed of a rotating wheel as they test a series of wheels on a downhill course of two parallel tracks. 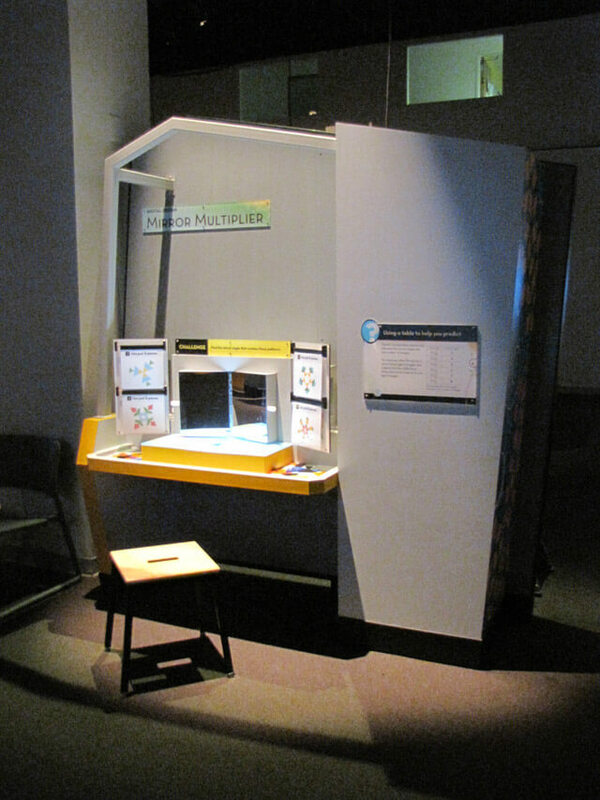 Mirror Multiplier—Visitors explore reflectional symmetry using colorful geometric pieces and a hinged pair of mirrors. 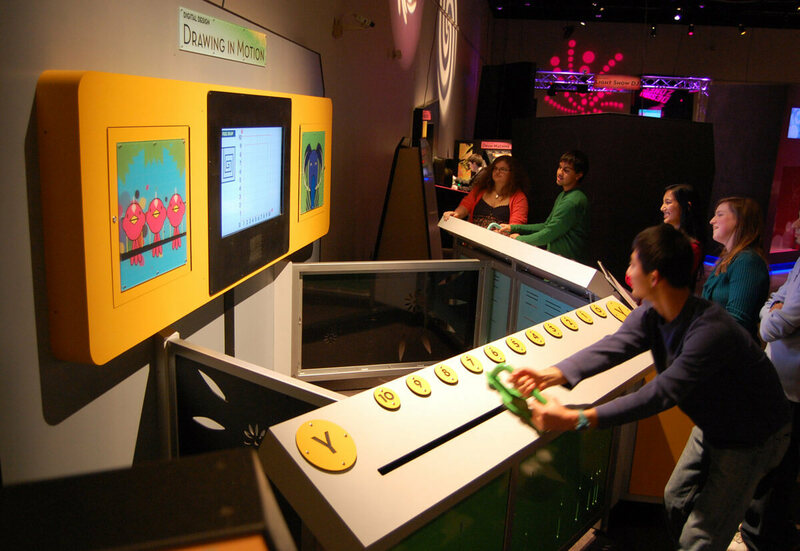 Drawing in Motion—Visitors become the designers as they move large sliders along number lines to manipulate a digital “pen” and draw on a monitor display. 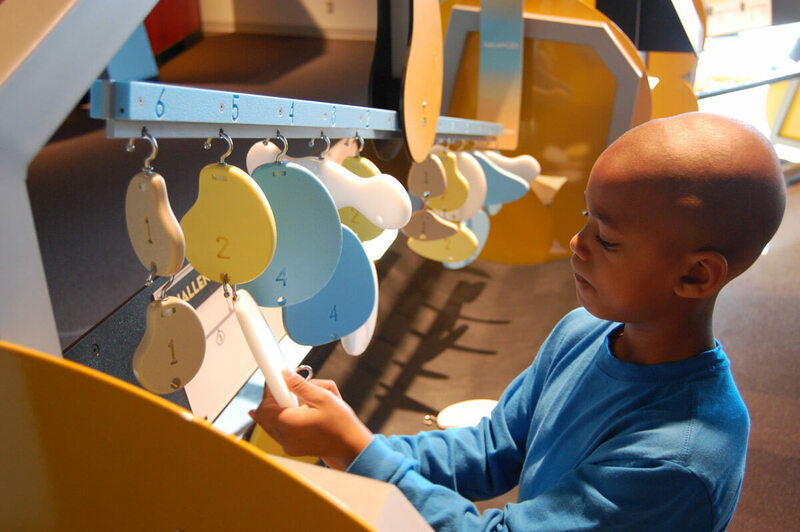 Balancing Art—Discover the math behind mobiles by creating balancing art from colorful pieces. 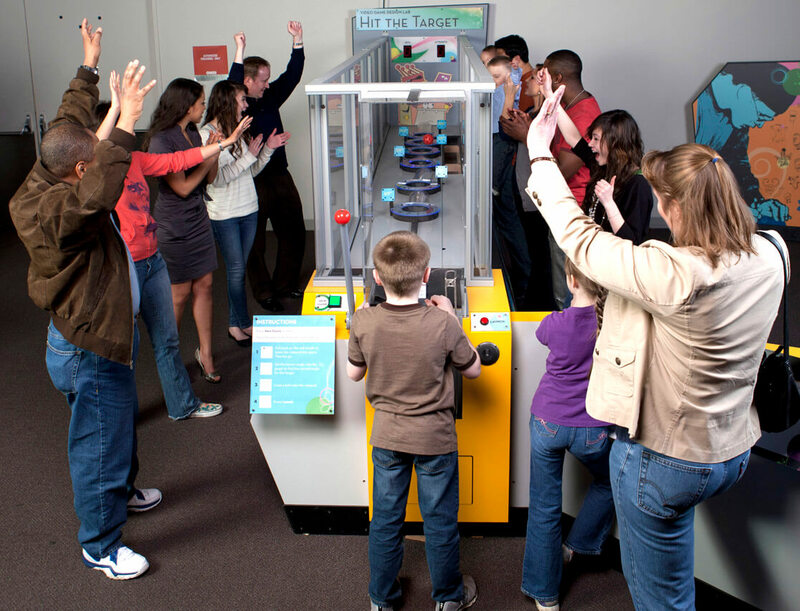 Build a Wall, Build a Plaza, Build a Tower—Visitors choose a challenge and test their abilities to continue a pattern in three dimensions as they try building a wall, a tower, or a plaza from custom printed architectural blocks. 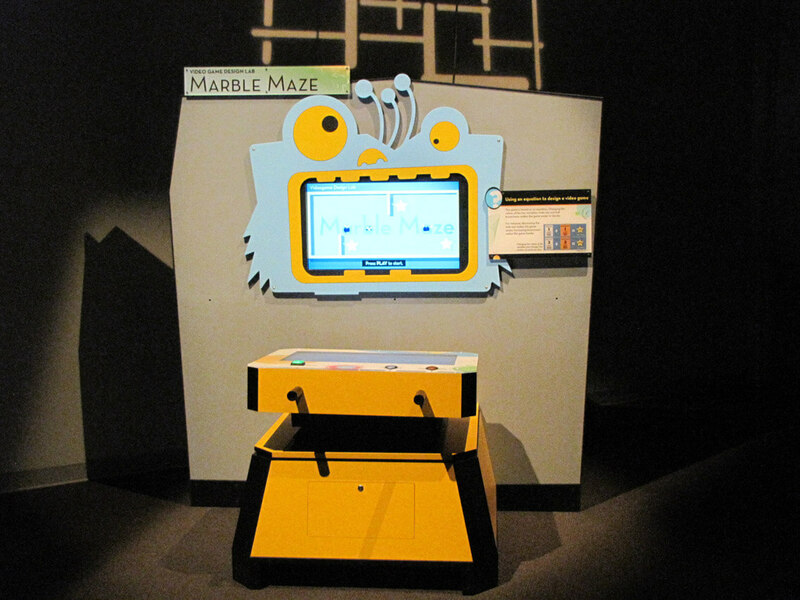 Marble Maze—The goal of the game is to navigate the maze, avoid the black holes, and roll over stars to collect points. 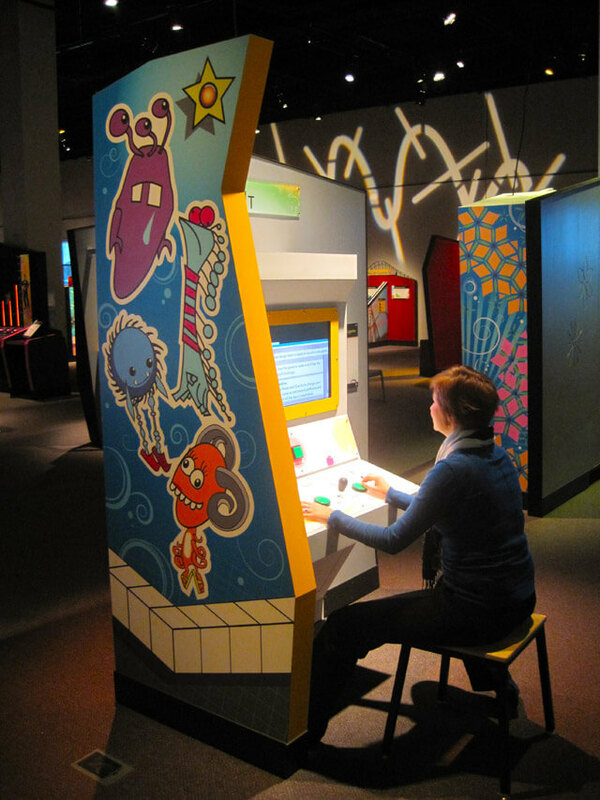 Adjust the variables and design a game that gives you the highest score. 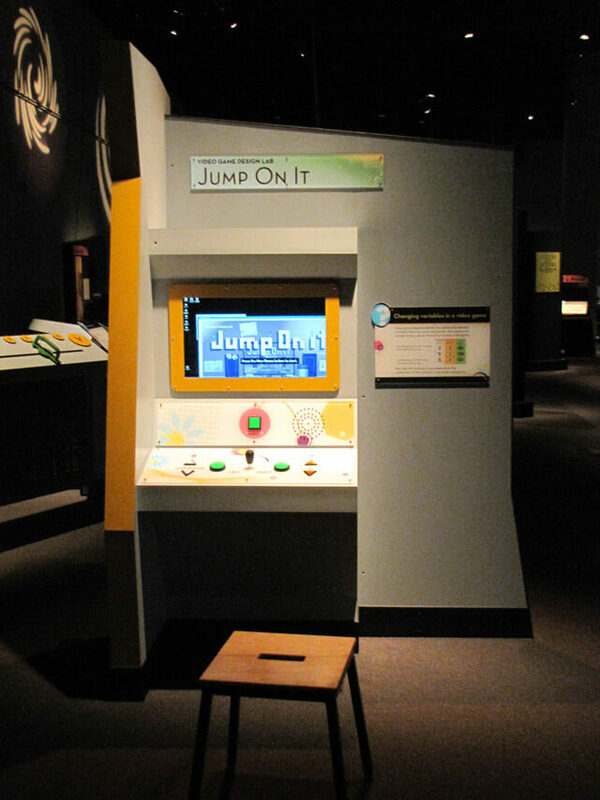 Jump On It—Like a classic arcade game! 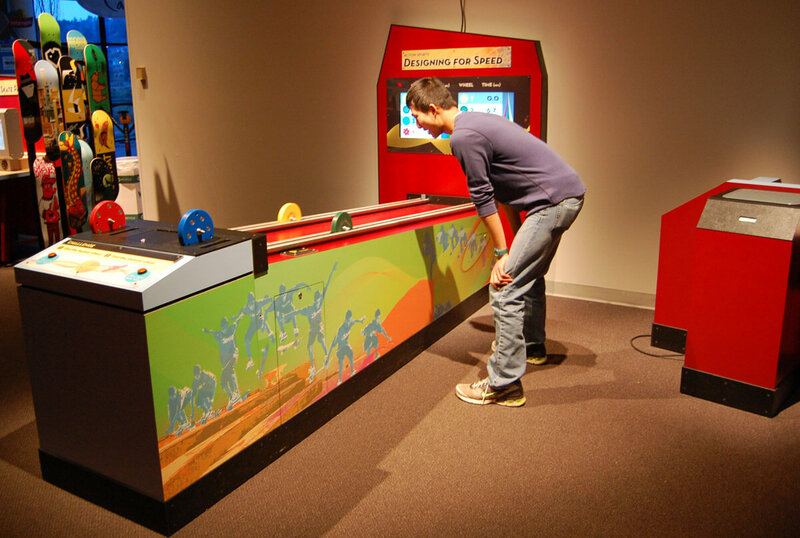 Visitors choose a character, select a scene, and adjust the jump power and gravity to find out how these variables affect the character’s jump height. 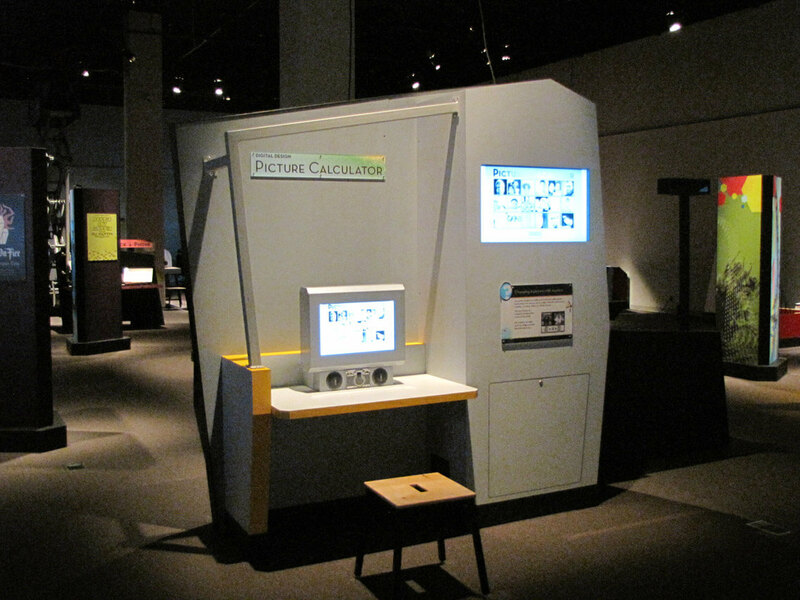 Picture Calculator—Take a selfie and manipulate the values of the pixels to transform your photo. 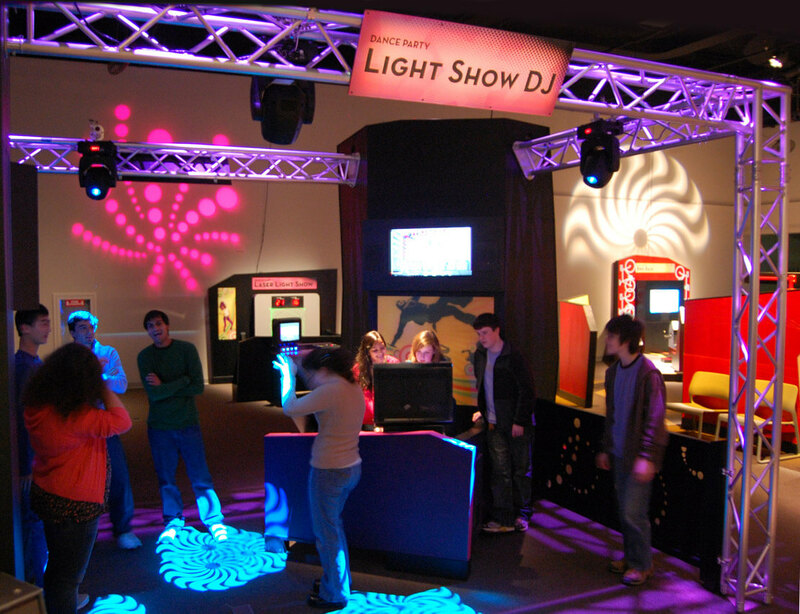 This video-based professional development program builds on findings from the REVEAL research study and is intended to be a catalyst for staff facilitators in museums, science centers, and other informal learning environments to discuss, reflect on, and improve their educational practices. 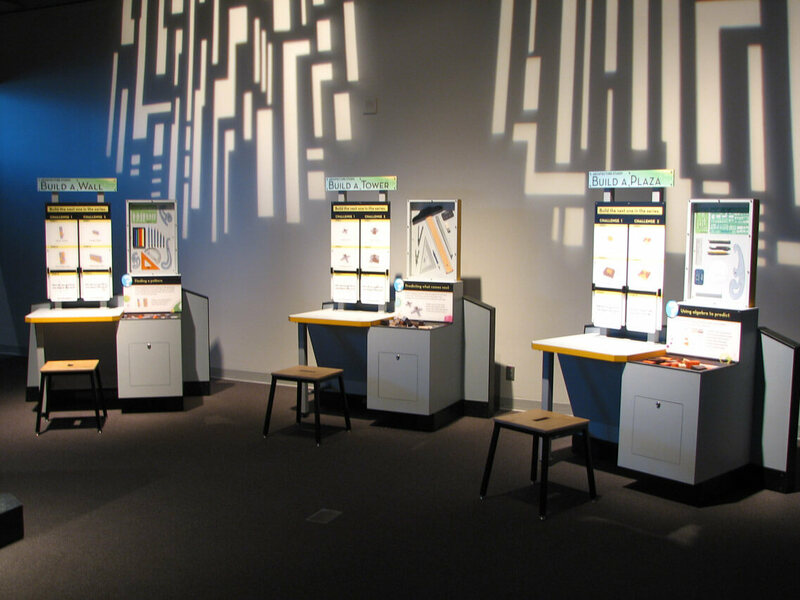 A sample floor plan so you can picture how Design Zone will look in your space. 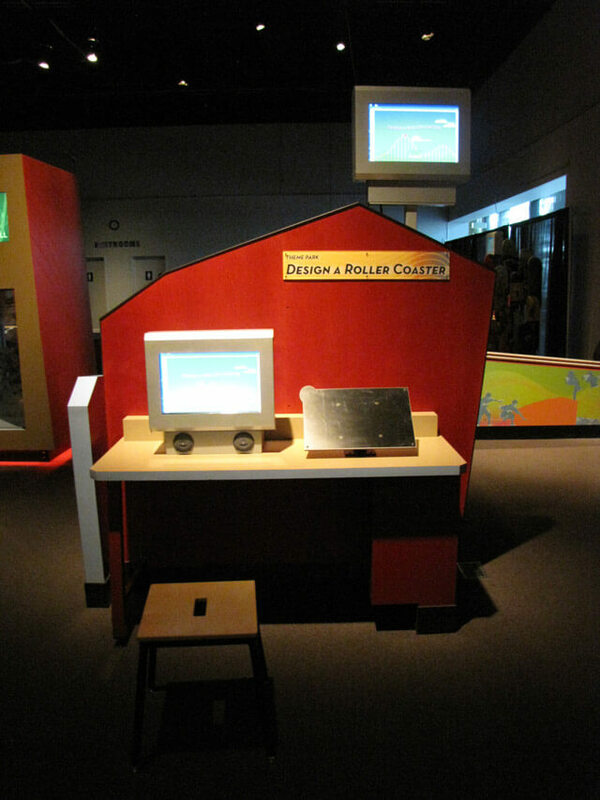 A printable fact sheet about Design Zone. 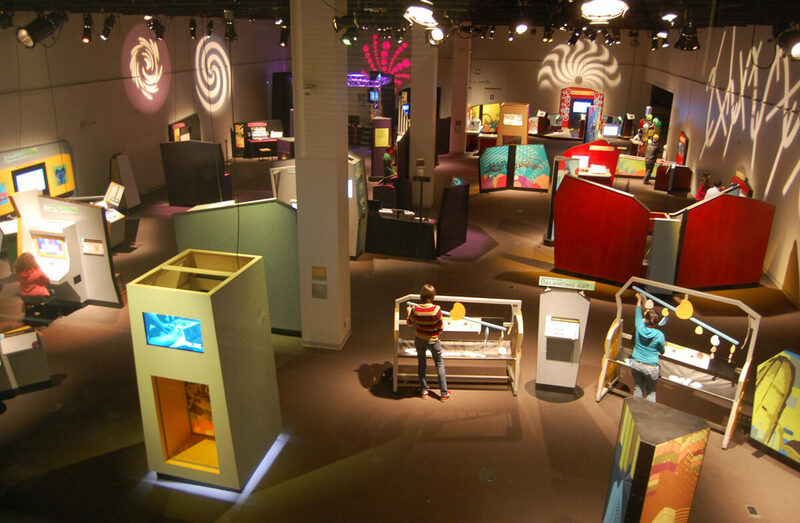 Tour Schedule for Design Zone. 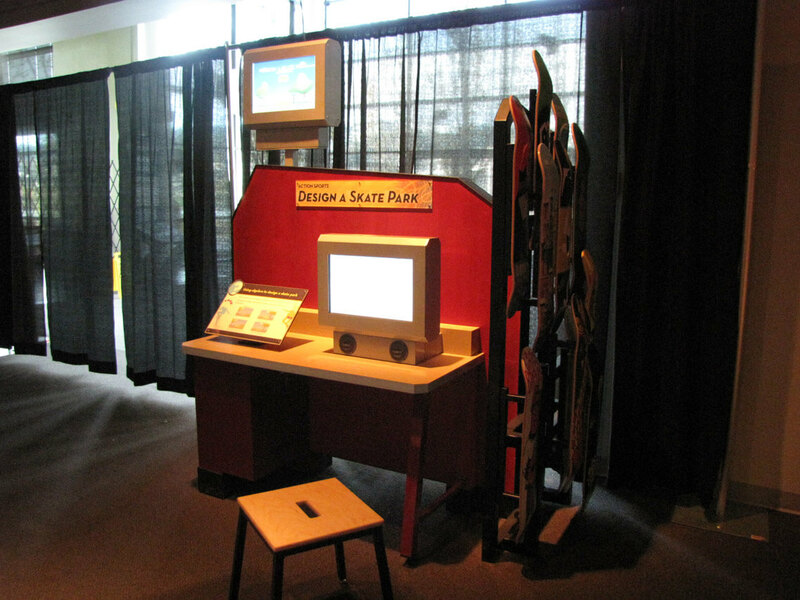 Design Zone was produced and is toured by the Oregon Museum of Science and Industry. 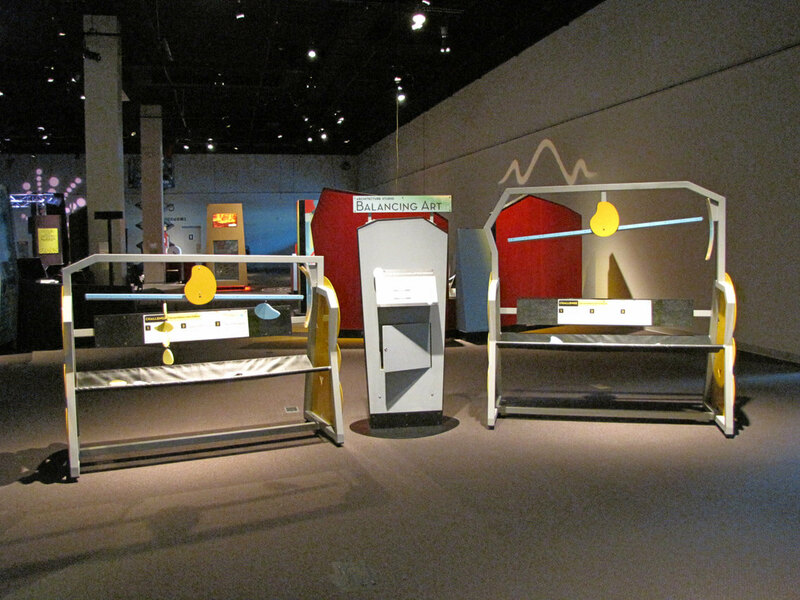 This exhibit was made possible by a National Science Foundation (NSF) grant (award number 0714634).